Last day of October has a very special meaning for all Americans and especially for American children. 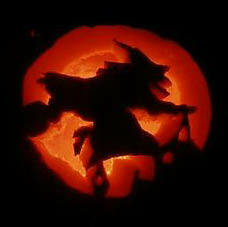 It is the holiday of witches, vampires and most of all the holiday of fear. It is Halloween. It was my first Halloween and I was so excited about it. It has a special atmosphere and everything is so mysterious. My mask wasn't very creative. I wore just the skull face. Finally it was an advantage because of the weather. We got few inches of snow the day before and the temperature dropped to zero (Fahrenheits) so People who had light masks on almost froze. My Halloween started already many days ago when we carved our pumpkins. It is a very significant habit and it is connected with Halloween as tightly as Christmas tree with Christmas. Then on yesterday we had a dinner with the friends in the town and waited until it got dark. "Trick or treat" cannot be done when it is light. That's not the right atmosphere. I waited if some "trick or treaters" would come but for our disappointment nobody came. Later I joined my friend and we went to trick or treat. Another definition of Halloween could be - easy way how to get a lot of free candies. It's really so easy. You just knock on the door and when somebody answers it, scream "trick or treat." People are already prepared and fill up your bag with candies. If you are lucky you can collect a few pounds. Some people are wearing also scary costumes like one man who we met. He hold knife, have crazy scientist hair and fake blood on his t-shirt. Pretty scary, isn't it? I don't know if it was because of the cold weather or if it is a modern way of Halloween, but lot of children was going with their parents in cars from house to house and just collected the candies. Strange, but it is effective.